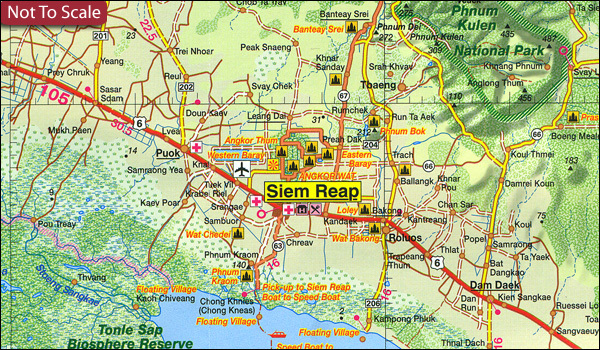 Cambodia at 1:750,000 on a road map from Gecko, with large indexed street plan of Phnom Penh, plans of Siem Reap with an enlargements for exploring the Angkor Wat area and of Sihanoukville with the Ream National Park, all extensively annotated with tourist facilities, etc. The main map at 1:750,000 provides a very clear picture of the country’s topography and its road and rail networks. Landscape is vividly presented by relief shading and spot heights, with various combinations of colouring and graphics to show different types of vegetation, from evergreen, deciduous or bamboo forests to grassland, mangrove and swamps. Road network clearly distinguishes different categories of roads, indicates unsurfaced sections, and shows intermediate distances on main routes and locations of border crossings. Railway lines, local airports and ferry connections are marked. The map also shows local administrative boundaries with names of the provinces. Towns of special interest and national parks are highlighted and a wide range of symbols indicate locations of temples, beaches, caves, waterfalls, etc. The map has a latitude and longitude grid at 30’ with ticks at 1’. Also included is a distance table and a small administrative map of the country, but there is no index of localities. Map legend includes English. On the reverse are detailed street plans of Phnom Penh and Siem Reap, each with extensive lists of hotels, restaurants, public buildings and various other facilities highlighted on the plans. The plan of Phnom Penh also has a street index. An inset at 1:150,000 shows in greater detail the area round Siem Reap from the Boeng Tonle Sap Lake to Banteay Srei, showing access to the numerous local temples. Three further insets cover the most visited part in the south of the country: Ream National Park - Sihanoukville area at 1:150,00, Sihanoukville with the local beaches at 1:50,000, and downtown Sihanoukville at 1:20,000, all annotated with symbols and lists of various facilities.